Heading to any amusement park tends to be super overwhelming. The crowds, the lines and soon-to-be exhausted/constant borderline tantrum throwing kids often leaves many of us wondering...why am I here again? Well, we all know why we are really there. Watching our kids light up at every turn, giggle with glee and experience every magical moment for the first time makes all that chaos worth it. Disneyland for us is a annual treat as the preparation and recovery are enough to last the rest of the year. 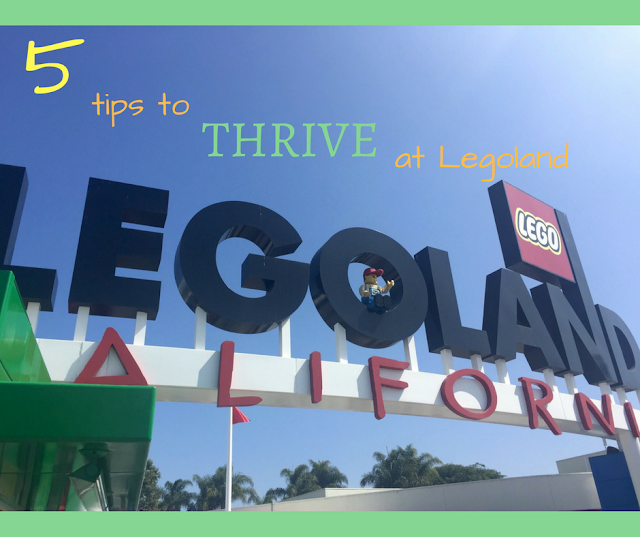 Our go-to amusement park of choice as So-Cal residents is Legoland! A mere 45 minutes from our house and full of exciting things for my little boys to do. 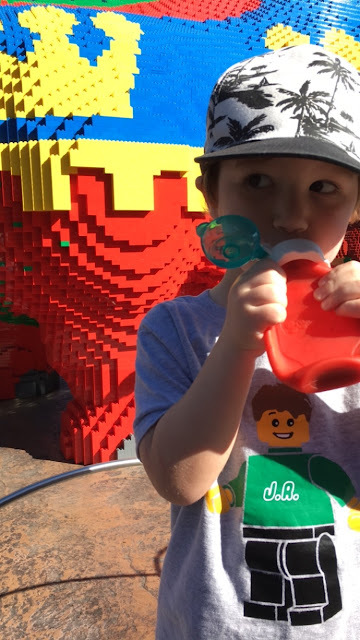 From water, to rides, lego stations to play structures, it really is perfect for small kids. It is actually probably better for smaller kids as it seems the "big kid" stuff is pretty limited. Since my guys are the PRIME age to enjoy such a heavenly spot it only made sense that we be season ticket holders so we could enjoy all that fun and dodge the crowds vowing ONLY to go on un-busy weekdays. Why wait in any lines if you don't have to? 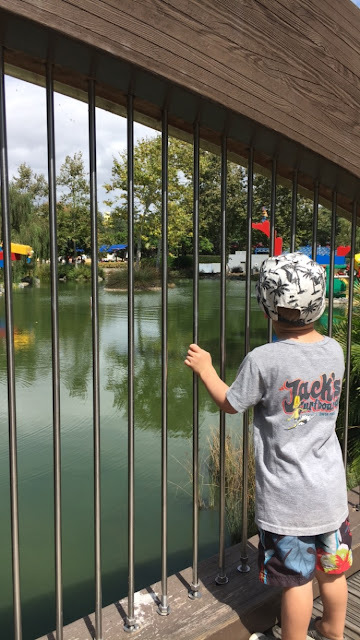 Not only does Legoland have the main park but it also has a full water park (beyond the super cool features within the park) and an impressively interactive aquarium (the food court there is quite good too). While it is great for kids, it is also great for the family budget as well. Season tickets (Merlin Annual) are only $199, which is a lot of money, don't get me wrong. BUT, that price includes, parking ($18 per trip), access to the main park, water park AND aquarium...ALL YEAR! Not to mention 20% off on all food and merchandise. You can guess what the boys got this year for Christmas from Mommy & Daddy! We bought a play pass the year before (pay for a day get the rest of the year free, which equated to about 6 months) but it was only for the park and didn't include parking. I mean, honestly the upgrade pays for itself just with parking costs alone! ANNNNDD ( I know, it doesn't stop) you get all sorts of perks too, like a free hotel stay, free one day passes for a guest of your choice for all pass holders and so much more! Man...maybe I should work in their sales department. So, now that I have you hooked and you want to go..let me share my top five tips. While these were created specifically for Legoland, they really apply to ALL amusement parks in general. As long as you are prepared for anything you are sure to THRIVE! 2. BRING YOUR WHEELS. Even if you think your kids are too old to ride in a stroller (my big boys often refuse) at least you have a "locker on wheels" (Thanks Mrs. A). Since these kid friendly parks have stroller parking everywhere, it is great to be able to stash all you need and wheel it wherever you go. Throw that diaper bag, backpack, snack bag and extra clothes bag on that thing and roll out! 3. SNACK CENTRAL. My kids eat literally every second of every day. It is imperative that I have snacks to last at least a week...yes for one day. They know they get a "treat" when they are there, but I would rather be prepared with their favorite go-to foods for snacks and lunch. Not only am I saving money, but I can toss them a snack-stacker while in line, no problemo. 4. WET & DIRTY IS THE NEW BLACK. One of my favorite things about Legoland is all the water features. 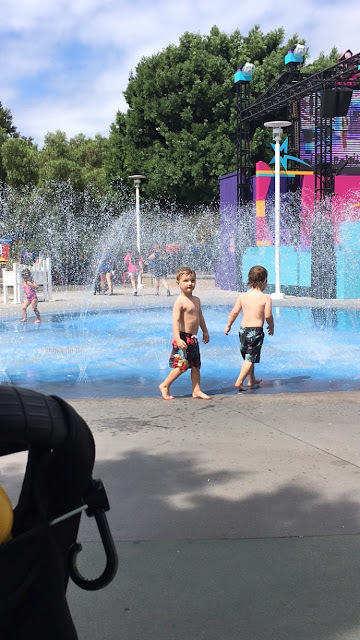 With two awesome splash pads and an entire play structure filled with water fun, you might as well just have your kids wear their swim suits to the park; I know I do. 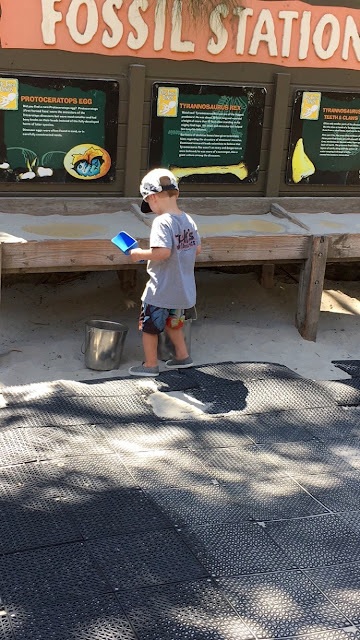 Between the water play, fossil station (huge sandbox filled with Dino bones...perfect for my scoop loving boys) and about a million other lego building stations, your kids are going to be filthy, soaked and oh so happy. 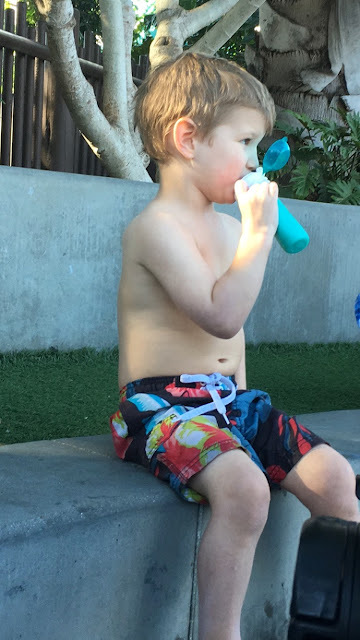 I bring a change of clothes for after their water play/digging is over, but for most of the day they are running wild in their swim trunks! 5. KEEP THE GOODS CLOSE TO THE HIP. 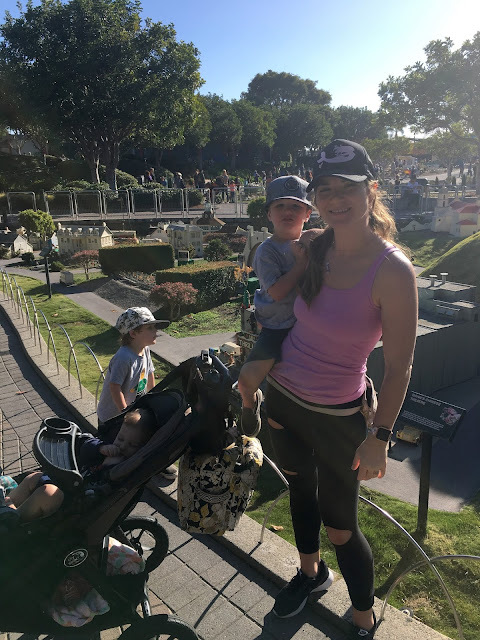 Since my stroller is bogged down with my daily essentials for all three kids, myself and usually my own Thriving Mommy (she of course never misses a trip as she is an essential part to our Lego crew...), I do not suggest leaving anything of real value on your stroller when you go on rides and park it. Sure, if someone wants to wheel off with my expensive stroller, Vera Bradley collection of bags filled with goodies...go for it. But my credit cards, ID, keys and phone? No way sucker, that is always on me. With my pouch snug on my hip I am always ready for hands free fun with the most essential items closely monitored at all times. I even stash a small sunscreen in there for safe keeping! If you are looking for any secrets or insider information, I am most likely your girl. Feel free to leave a comment asking for more and I will do my best to help you out. Now get planning your next trip and look for me while you are there!